We're one step closer to being a more bike-friendly city! 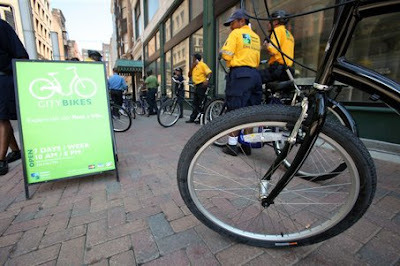 Check out this article from The Plain Dealer about the Downtown Cleveland Alliance's bike rental program, City Bikes, which launches today. You can find them on East Fourth Street, across from Flannery's Pub, from 10am to 8pm daily through August 31 (limited availability in September). Cost is $15 for two hours, $6 for a one-hour noon rental.